Our beautiful 1.18 ct.tw Bridal Set incorporates antique design etchings and features an extravagant 0.75 carat Round cut diamond center Engagement Ring set on cathedral crown accompanied by 0.50 ct.tw Round cut side stones. 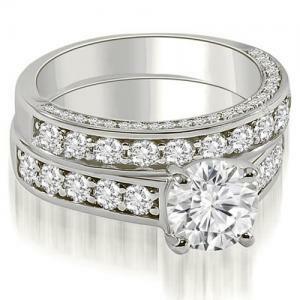 The beautiful Wedding Band has a classic design and features 0.43 ct.tw Round cut diamonds. All diamonds are hand-selected to match in color, size and quality. They are rated as I1 in clarity and H-I in color. The diamonds on this set have exceptional brilliance and are set on lustrous 14KT White Gold.